Basketball is an ever evolving sport. Since the success of the Golden State Warriors in the NBA over the last seasons, the number of three point attempts are rising exponentially. The Warriors have in Steph Curry and Klay Thompson two of the all-time best shooters who have extended every notion of shooting range almost up to half court. Last year, the Houston Rockets with James Harden finished the season taking more threes than two point shots! Whether this crazy amount of threes is a justified shot selection, is pure mathematics. Whenever you hit those shots at a percentage that is high enough, it is a good shot because it results in 3 instead of 2 points. 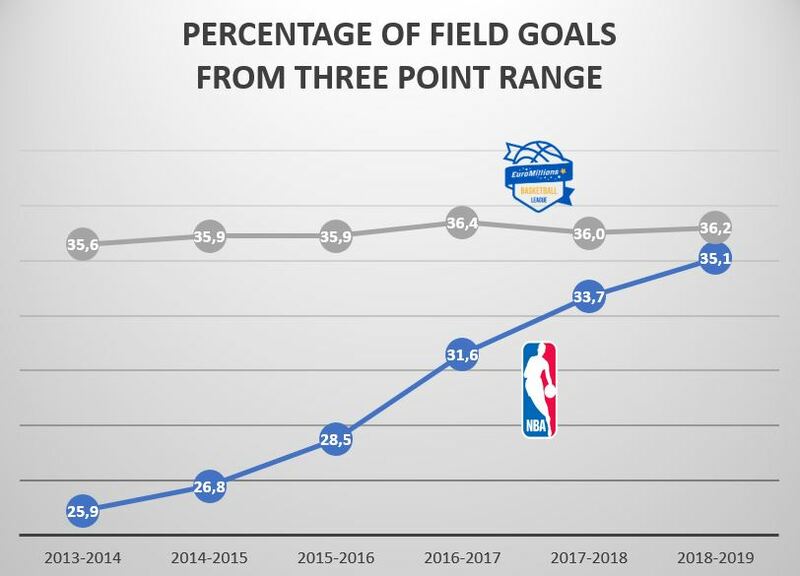 And the combination of more focus on shooting, better coaching and transforming player profiles makes that the percentage of hitting three point shots is going up in the NBA, despite the higher volume in shots. Nowadays, in a regular NBA game, almost all shots are either lay-ups/dunks or either three point shots. Older players like Chris Paul and Dwayne Wade seem to be some of the last survivors of a so-called mid-range game. And the fans … they seem to LOVE it, since the NBA keeps expanding its global popularity worldwide. 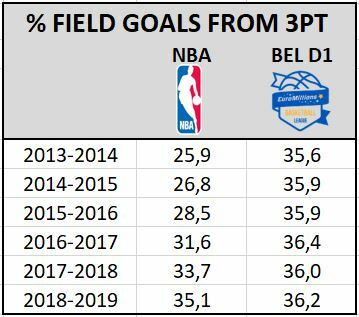 This current ’18-’19 season, 36,2% of all field goals in Belgium are taken behind the 3pt arc, while it is 35,1% in the NBA. If we look at the highest level in European basketball, we see the same trend. In this Euroleague competition 36,9% of all shots this season are from three. And the shooting percentages? Well, they are comparable. In this current season, the success rate behind the arc in Belgium is 34,7%, while 35,3% in the NBA. Here, one has to say that in Belgium, according to the FIBA rules, the three point line is 50 cm closer to the basket than in the NBA. It is no coincidence that we see so many threes from the corner, since the three point line there is 20 cm closer to the basket compared to the top of the key. If we compare the use of the three point shot between the teams in our league, we see huge differences. Kangoeroes Mechelen is the team that takes proportionally the most three points shots. More than 45% of their shots are from behind the arc. 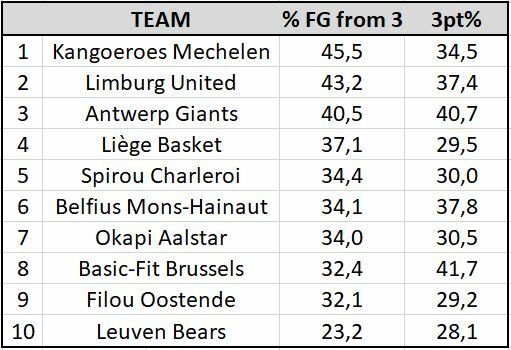 Leuven Bears takes the fewest threes, only 23% of their field goals, which seems justified since they also have the weakest shooting percentage from three (28%). At first sight, Antwerp Giants seems to find the most optimal balance in their shot selection, since they take +40% of their shots from deep (ranked 3rd) at the 2nd highest percentage of the league (40,7%). The injury of key inside threat Moses Kingsley and the remarkable improvement from 3 of Vanwijn since his arrival in Antwerp are key factors in this shot selection. 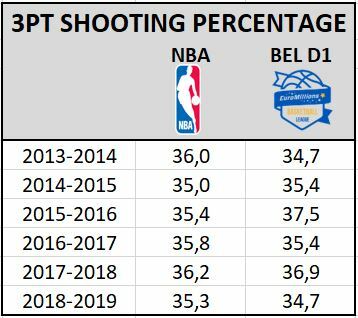 The Belgian team with the highest 3pt% is Basic-Fit Brussels (41,7%), while they take proportionally the 3rd least three point shots of all teams. There is however one big difference between the NBA and our EMBL. In the NBA we find the teams that take proportionally the most threes high in the rankings, while in Belgium Kangoeroes Mechelen and Limburg United are respectively ranked 6th and 7th out of 10 teams. The leader of the championship so far, Filou Oostende, take the 2nd fewest threes of all teams… Of course, the shot selection of a team is only one aspect of a basketball game. In the upcoming weeks we will focus more on other keys in offense and defense to explain the success or failure of the Belgian teams. Pascal Meurs is holder of the FIBA Europe Coaching Certificate. Currently, Pascal is active as head coach for T71 Dudelange in the Total League in Luxemburg & acts as an analyst for Eleven Sports Network on Belgian TV. (BSW Weert), France (Arras women) and Belgium (DBC Houthalen women). As a FIBA-instructor, he shared his knowledge in Qatar, Tunisia, Albania and spent two months in the coaching staff of NCAA1 St-Joseph’s Hawks.